There are two types of athletes I get the most joy out of coaching…First are the first timers, those that simply want to complete an Iron distance triathlon. This is something that should not go unnoticed! It is the toughest one day event in the world that takes an incredible amount of time and energy to complete. Just go to any Iron distance event in the final 2 hours and you will see the most incredible outpouring of human spirit that one can witness in this day and age of instant gratification. Most that come to me for help in this department are completely raw, have not read a bunch of articles that contradict each other on what to eat or how to train, they simply have a goal and just want to swim, bike and run. They listen to everything I say and execute every day to the best of their circumstances! This group is a bit more challenging because most have been exposed to all things I try to protect the newbies from; the easy way, the latest super chain, or bearing, or helmet, or bike that is going to make them go like a rocket. The reality is you cannot run away from the hard work that is required to get to the highest level in our sport. If you have aspirations of qualifying for Kona you must be bullet proof both physically and mentally! Such aspirations sometimes call for an unorthodox approach. My old coach Brett Sutton of Trisutto Coaching used to dish out what he would call “Willpower” days which were triple bike or run days, 100 x 100 in the pool, or 50km runs during the middle of the day under the blazing sun. So this past February my partner in crime (and life) Carrie Lester and I had a group of our athletes come to our home in Southern California so we could put them through a “Willpower Week”, a 6 day escape from the winter back East, which included 4 big days of riding with a swim, bike, and run day wedged in the middle. The purpose of this week was simply to get the gang to push beyond what they thought was possible. Before going any further I must mention that before attempting such a training block with a group of people, you better be certain that the personalities gel, that they all get along, and there are no egos involved. Last year was a dry run as I had the entire group here for a more traditional training camp with swim, bikes, and runs spread out more evenly. But this year with all having very high aspirations I felt we needed to push them a bit further! Here is a brief summary of the work we did. Day 1: 75 mile ride with 6000 ft of climbing that took us from Santa Isabel, which is just outside of San Diego, to the high desert of Borrego Spring where we climbed back out the backside to Juian before descending home to Santa Isabel. Day 2: 100 mile ride which went up the famous Kitchen Creek Climb to the top of Mt. Laguna. In all, we climbed over 8000 ft and finished the day with an easy 20 min jog off the bike. Day 3: Swim Day: We did a 4 km swim with some instruction and then finished off with an easy recovery jog. 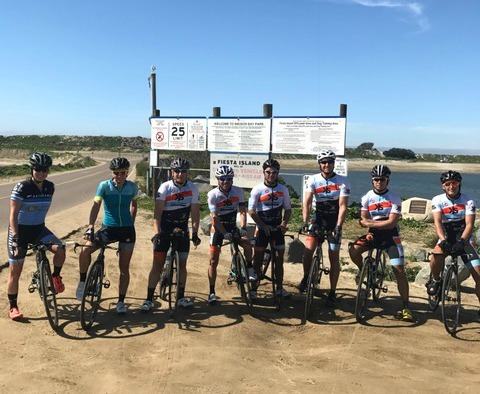 Day 4: We began with a 3 km wake up swim then rode from our base in Cardiff to the birthplace of Triathlon, Fiesta Island, where the group did individual Time Trial Intervals for 1.5 hours. Upon completion, we rode home where the group did an 8 km transition run. Day 5: Once again, we returned to the pool for a shakeout swim of 3 km before heading out on the bikes. We had planned a nice little tour of the coast which would take us from Encinitas north to Dana Point where we would stop for lunch. Unfortunately, or fortunately, as the group was starting to crack at this point… we were stopped just 1.5 hours into our ride at the edge of Camp Pendleton. We had to abort our journey due to military exercises that were going on just off the coast. I could tell the gang was about to crack so I decided it best to turn around and head straight to the World Famous V.G. Donuts. I gave some the option to ride another 1.5 hours but they chose to rest for the evening’s mandatory bowling night. Day 6: For the final day of the week I had planned one last day of riding around the loop that has produced multiple World Champions over the years, The Henshaw Loop. This was the day that was going to really, really push the gang beyond what they thought they were capable of. But old man winter decided to show his face once again and with heavy rain in the forecast I had to make the call to cancel the ride. So instead we did a medium long run of 1.5 hours and then hit the pool for 1 last swim. Even though the last 2 days did not go 100% as planned everyone left here physically and mentally stronger than when they arrived and I was able to show them first hand that sometimes just because we write a week’s worth of training sometimes we have to be smart and adjust rather than be stubborn. Being smart and making such adjustments usually saves us from getting sick or injured, so let common sense override from time to time. If you’re a coach and want to hold a camp like this or a group of friends want to support each other through such a week here are a few tips. • As mentioned make sure everyone in the group gets along! • Ideally make sure everyone attending is around the same ability level! Thanks for reading and I hope if you plan such a week all who attend will have a great time!